There's a great profile of Carlos Slim in the New Yorker this week. Slim is one of the richest men in the world and recently took a big stake in the financially troubled New York Times. Unfortunately, the online version is subscriber only. Here is a brief summary of the article (excerpts from the summary below). Near the end of the article the writer describes a meeting between Slim and one of his most visible critics, Denise Dresser, a Princeton-trained academic (Instituto Tecnológico Autónomo de México) and political analyst. I suspect a look through Dresser's work might be of interest for those who want to disentangle the political economy of Mexico. Human decision-making deviates in one way or another from the standard assumptions of the rationalistic paradigm in economics. If such deviations from rationality and self-interest were small and purely idiosyncratic, they would on average cancel out, and economic theory would not be too wide off the mark when predicting outcomes for large aggregates of agents. Following the lead of Vernon Smith, early studies of alternative market mechanisms by experimental economists can be viewed as tests of the hypothesis of idiosyncratic deviations from standard economic theory. If deviations from rationality and self-interest were systematic, however, this would call for a revision of economic theory itself. 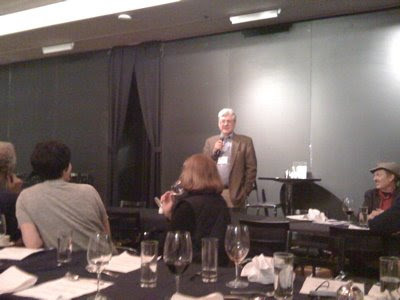 ...now Nobel Laureate Vernon Smith has decided to speak openly about what he calls the deficiencies and the selective advantages of Asperger's. Smith says his capacity for deep concentration contributed to his ability to win the Nobel Prize. “Perhaps even more importantly, I don't have any trouble thinking outside the box,” he said. “I don't feel any social pressure to do things the way other people are doing them, professionally. And so I have been more open to different ways of looking at a lot of the problems in economics." CNBC: Did you feel like you seemed strange in the eyes of other people? SMITH: Sometimes I'm described as "not there" in a social situation. You know, a social situation that lasts for a couple of hours I find it to be a tremendous amount of strain, so I've been known just to go to bed and read. Perhaps most interesting to me, Smith was an undergraduate physics major at Caltech. The excerpt below is from Smith's Nobel autobiography. See also his recently published memoir, and this podcast interview on Econtalk. ...neither I, nor my parents, or anyone in my family, or any neighbor or friend, had any idea how to go about choosing a college. So, I went to the city library, found a book on choosing a college, and learned among other things that the 'best' college in the United States was Caltech. Being naïve and impetuous I decided that I should prepare myself to enter Caltech, as, without preparation, my 'C' average in High School would not even qualify me to take the entrance exam. A serious Quaker College, Friend's University, was located near my home in West Wichita. I enrolled in physics, chemistry, calculus, astronomy and literature courses for one year, earned top grades, and sat for the entrance exams for Caltech. ...Caltech was a meat grinder like I could never have imagined. I studied night, day, weekends and survived hundreds of problems, but what a joy to take freshman chemistry from Linus Pauling, hear physics lectures by J. Robert Oppenheimer on his frequent visits to Caltech, attend a visiting lecture by Bertrand Russell, and regularly see von Karman, Anderson, Zwicky, Tolman, Millikan and other legendary figures of that time, on campus. For micro I supplemented with courses Samuelson taught down the Charles River at MIT. After Caltech, Harvard seemed easy, and I got virtually straight A's. ...Graduate school is an endurance test, but was not that demanding for me after having survived the undergraduate meat grinder. The first thing to which one has to adapt is the fact that no matter how high people might sample in the right tail of the distribution for "intelligence," ... that sample is still normally distributed in performing on the materials in the Caltech curriculum. The second thing you learn, if you were reared with my naive background, is the incredible arrogance that develops in conjunction with the acquisition of what you ultimately come to realize is a really very, very small bit of knowledge compared with our vast human ignorance. ... the difference between Harvard and Caltech: "At Harvard they believe they are the best in the world; at Caltech they know they are the best in the world." Princeton University Press sent me a copy of Guesstimation: Solving the World's Problems on the Back of a Cocktail Napkin, by professors Lawrence Weinstein and John A. Adam. The book is a compendium of Fermi problems -- that is, problems which are simply stated and whose answers can be estimated at the order of magnitude level through simple logic from a few factual inputs. The classic Fermi problem is: How many piano tuners are there in Chicago? 1. How many blades of grass are on your front lawn? Luckily I got them both right. The experimentalist in the examining pair, Paul Richards, held up a cylindrical metal device of some sort and asked me what it was. He let me hold it; it was heavy. I stared at him blankly. To this day, I still don't know what the gizmo was :-) I suppose I was destined to be a theorist! Watching someone work out a Fermi problem in real time reveals a lot about their brainpower. Wall Street firms, consultancies like McKinsey, Microsoft, and even small startups have been known to ask these kinds of questions of job applicants. This book discusses similar problems in a business context. 1. If the sun stopped radiating energy, what temperature would the surface of the Earth cool to? 2. In the above scenario, could humans survive using current technology if given enough time to prepare? Weinstein and Adam's book is a nice collection. None of the problems require any specialized knowledge of math or physics; the level is appropriate for a bright kid or moderately technical reader. Another book recommendation. I've never understood the fundamental moral or ethical justification for international law or national sovereignty in contested geographies, other than what Australian historian David Day calls Right of Conquest -- Might Makes Right, followed by propaganda, myth making and "history" written by the victors. "I don't live this double life, benefiting from the fact that my house is built on some other tribe's land and then pretending to regret that. I'll always remember having to study Bury My Heart at Wounded Knee, and everyone sobbing for the poor Indians, but nobody's gonna give them the land back. I mean, one way or the f*#king other: either you give them the land back, or you admit you're a predator and you eat meat." Podcast interview with the author. In the interview Day notes that the idea for the book came from the contrasting attitudes of Churchill and Australian Prime Minister Menzies during the second world war. Churchill seemed confident that Britain as a nation and people could survive a defeat by the Germans, whereas Menzies feared that the European presence in Australia could not survive a Japanese victory. The history of the world has been the history of peoples on the move, as they occupy new lands and establish their claims over them. Almost invariably, this has meant the violent dispossession of the previous inhabitants. Whether it is the Normans in England, the Chinese in Tibet, the Germans in Poland, the Indonesians in West Papua, or the British and Americans in North America, the claiming of other people's lands and the supplanting of one people by another has shaped the history of societies from the ancient pastto the present day. David Day tells the story of how this happened - the ways in which invaders have triumphed and justified conquest which, as he shows is a bloody and often prolonged process that can last centuries. And while each individual conquest is ultimately unique, nevertheless they often share a number of qualities, from the re-naming of the conquered land and the invention of myth to justify what has taken place, to the exploitation of the conquered resources and people, and even to the outright slaughter of the original inhabitants. Above all, as Day shows in this hugely bold and ambitious book, conquest can have deep and long-lasting consequences - for the conquered, the conquerors, and for the wider course of world history. In Conquest David Day poses the question fundamental to all studies of imperial expansion by all societies: ‘how does a society that moves onto the land of another make that place its own?’ To find an answer he examines ten common strategies, ranging from striking a legal claim to colonization. This is a highly original approach. It demonstrates a spectacular knowledge of contrasting situations across the globe and forces the reader to rethink old certainties. It should be read by all students of ‘supplanting societies’ of all races and in all continents. David Day's thesis is simple but controversial: it is that no nation or people now exists who have been in continuous occupation of the land which they regard as their own, and that there is none that did not seize the land on which they live from some previous possessors by force of conquest. This deceptively simple, indeed obvious, conclusion based on wide reading has profound implications for the ways in which we view the exercise of power, the notion of ‘just war’, the theoretical underpinnings of any modern nation's right to exist. It also profoundly challenges the basic polarity of postcolonial studies, that between colonizer and colonized. Highly recommended: FT journalist Gillian Tett, a PhD in social anthropology, discusses her book on the financial crisis: Fool's Gold, at an LSE public lecture. I haven't read the book yet, but it's on my list :-) Here are two nice excerpts that appeared in the FT. She does a great job of covering the birth and development of credit derivatives, CDOs, etc. Below is a discussion of correlation from the first excerpt. Demchak was acutely aware that modelling the risks involved in credit derivatives deals had its limits. One of the trickiest problems revolved around the issue of “correlation”, or the degree to which defaults in any given pool of loans might be interconnected. Trying to predict correlation is a little like working out how many apples in a bag might go rotten. If you watch what happens to hundreds of different disconnected apples over several weeks, you might guess the chance that one apple might go rotten – or not. But what if they are sitting in a bag together? If one apple goes mouldy, will that make the others rot too? If so, how many and how fast? Similar doubts dogged the corporate world. JP Morgan statisticians knew that company debt defaults are connected. If a car company goes into default, its suppliers may go bust, too. Conversely, if a big retailer collapses, other retail groups may benefit. Correlations could go both ways, and working out how they might develop among any basket of companies is fiendishly complex. So what the statisticians did, essentially, was to study past correlations in corporate default and equity prices and program their models to assume the same pattern in the present. This assumption wasn’t deemed particularly risky, as corporate defaults were rare, at least in the pool of companies that JP Morgan was dealing with. When Moody’s had done its own modelling of the basket of companies in the first Bistro deal, for example, it had predicted that just 0.82 per cent of the companies would default each year. If those defaults were uncorrelated, or just slightly correlated, then the chance of defaults occurring on 10 per cent of the pool – the amount that might eat up the $700m of capital raised to cover losses – was tiny. That was why JP Morgan could declare super-senior risk so safe, and why Moody’s had rated so many of these securities triple-A. The fact was, however, that the assumption about correlation was just that: guesswork. And Demchak and his colleagues knew perfectly well that if the correlation rate ever turned out to be appreciably higher than the statisticians had assumed, serious losses might result. What if a situation transpired in which, when a few companies defaulted, numerous others followed? The number of defaults required to set off such a chain reaction was a vexing unknown. Demchak had never seen it happen, and the odds seemed extremely long, but even if there was just a minute chance of such a scenario, he didn’t want to find himself sitting on $100bn of assets that could conceivably go bust. So he decided to play it safe, and told his team to look for ways to cut their super-senior liabilities again, irrespective of what the regulators were saying. That stance cost JP Morgan a fair amount of money, because it had to pay AIG and others to insure the super-senior risk, and those fees rose steadily as the decade wore on. In the first such deals with AIG, the fee had been just 0.02 cents for every dollar of risk insured each year. By 1999, the price was nearer 0.11 cents per dollar. But Demchak was determined that the team must be prudent. 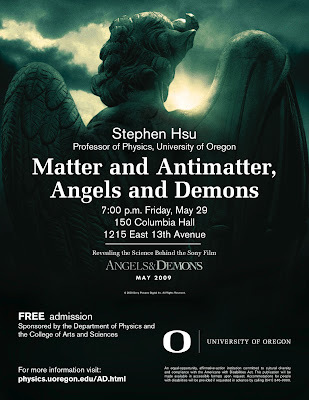 Next week I'm giving a public lecture on the science behind the latest Dan Brown blockbuster, Angels and Demons. Sony Pictures and the US LHC collaboration have coordinated similar talks across the country. What can I say? It's a good chance to talk to the general public about antimatter, particle physics and cosmology. I'll post my slides and video of the talk. One point I'll make in the talk is that Dan Brown has accessed some powerful symbolism here -- contrasting the Catholic church and Vatican with modern particle physics and the massive detectors at the LHC. 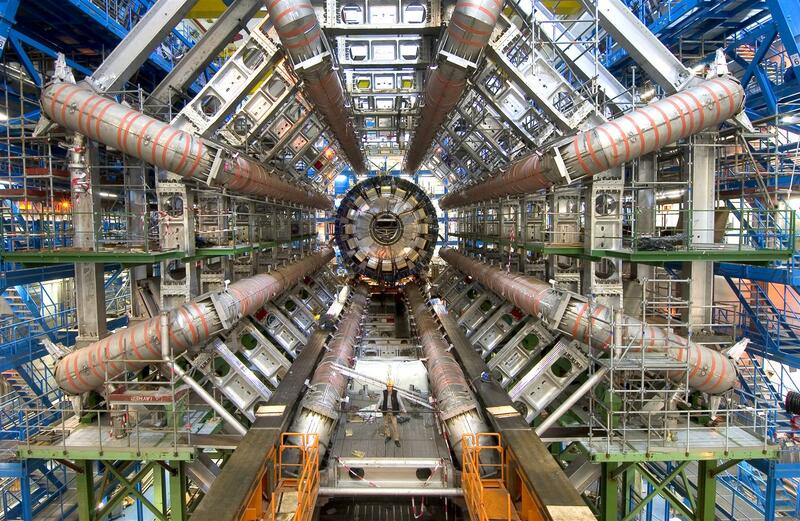 The Atlas detector at LHC (click for larger version). Director Ron Howard talking about the science vs religion aspect of the film. A simple test administered to four year olds has impressive predictive power for later life outcomes. Are we talking about an IQ test? No, a test of self-discipline, or the ability to delay gratification. In the 1960s, a group of four year olds were given a marshmallow and promised another if they could wait 20 minutes before eating the first one. Some children could wait and others could not. The researchers then followed the progress of each child into adolescence, and demonstrated that those with the ability to wait were better adjusted and more dependable (determined via surveys of their parents and teachers), and scored an average of 210 points higher on the Scholastic Aptitude Test. See also this update on the research in the New Yorker. ...Footage of these experiments, which were conducted over several years, is poignant, as the kids struggle to delay gratification for just a little bit longer. Some cover their eyes with their hands or turn around so that they can’t see the tray. Others start kicking the desk, or tug on their pigtails, or stroke the marshmallow as if it were a tiny stuffed animal. ...Mischel and his colleagues continued to track the subjects into their late thirties—Ozlem Ayduk, an assistant professor of psychology at the University of California at Berkeley, found that low-delaying adults have a significantly higher body-mass index and are more likely to have had problems with drugs—but it was frustrating to have to rely on self-reports. “There’s often a gap between what people are willing to tell you and how they behave in the real world,” he explains. And so, last year, Mischel, who is now a professor at Columbia, and a team of collaborators began asking the original Bing subjects to travel to Stanford for a few days of experiments in an fMRI machine. ...The scientists are hoping to identify the particular brain regions that allow some people to delay gratification and control their temper. They’re also conducting a variety of genetic tests, as they search for the hereditary characteristics that influence the ability to wait for a second marshmallow. It seems to me that the ability to delay gratification (future orientation), as tested in the experiment, is only moderately correlated with IQ. We all know high IQ slackers and diligent people of average intelligence. The data also show that IQ is highly correlated with income but much less so with accumulated wealth. Both diligence and intelligence are necessary for success in life, which is why the tried and true inputs used in college admissions are high school grades and SAT score. The former are somewhat more correlated with diligence than the latter, so between the two we get a metric which is sensitive to both psychological factors. Time orientation (like other personality factors) and IQ are heritable traits. The dreaded issue of group differences is mentioned briefly in the New Yorker piece. Mischel took young children from both ethnic groups and offered them a simple choice: they could have a miniature chocolate bar right away or, if they waited a few days, they could get a much bigger chocolate bar. Mischel’s results failed to justify the stereotypes—other variables, such as whether or not the children lived with their father, turned out to be much more important—but they did get him interested in the question of delayed gratification. This is one of the great documentaries of all time -- it's beautiful and tragic and all too real. The entire 2 hours is available on Google video (click below). See also this interview with the filmmaker. Some time in the 1960's, in the heart of Africa, a new animal was introduced into Lake Victoria as a little scientific experiment. The Nile Perch, a voracious predator, extinguished almost the entire stock of native fish species. The new fish multiplied so fast that its white fillets are today exported all around the world. Huge hulking ex-Soviet cargo planes come daily to collect the latest catch in exchange for their southbound cargo… Kalashnikovs and ammunition for the uncounted wars in the dark center of the continent. This booming multinational industry of fish and weapons has created an ungodly globalized alliance on the shores of the world’s biggest tropical lake: an army of local fishermen, World Bank agents, homeless children, African ministers, EU-commissioners, Tanzanian prostitutes and Russian pilots. 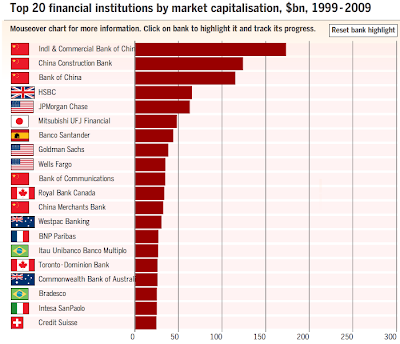 A correspondent sent me this graphic from the Financial Times, which lets you see the 20 largest banks in the world by capitalization, and how the list changed over the last 10 years. 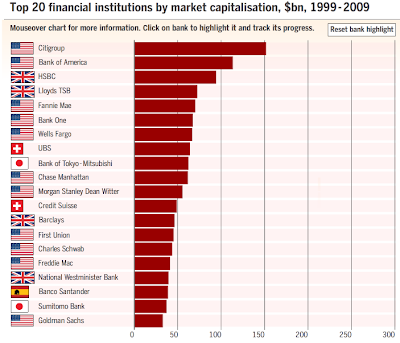 The first figure below shows the rankings in 1999 -- mostly US banks, with some Japanese, Swiss and UK firms as well. Guess who dominates the rankings today (second figure)? Guess how much top executives at Citi were paid over the last decade to run the bank into the ground? Robert Rubin, where are you? See earlier post Clawbacks, fake alpha and tail risk. If you are attuned to the geek universe, you've probably already heard the rumors about WolframAlpha, the "computational knowledge engine" from Steve Wolfram, the creator of Mathematica. The service is scheduled to launch this weekend, and media hype has already reached a frenzy -- see, e.g., this NYTimes article. My experience has confirmed over and over again that big brains tend to do interesting things. Whenever I meet someone who is "scary smart" (there are not so many in the world), I keep an eye out for what they do later in life. ...At its heart is a formal Mathematica representation. Its inference engine is basically a large number of individually hand-engineered scripts for tapping into data which he and his team have spent the last several years gathering and "curating". For example, he has assembled tables of historical financial information about countries' GDP's and about companies' stock prices. In a small number of cases, he also connects via API to third party information, but mostly for realtime data such as a current stock price or current temperature. Rather than connecting to and relying on the current or future Semantic Web, Alpha computes its answers primarily from his own curated data to the extent possible; he sees Alpha as the home for almost all the information it needs, and will use to answer users' queries. In an important sense, Alpha is a logical extension of Mathematica: it extends the range of types of information for which significant power can be gained by manually, and exhaustively, enumerating a large set of cases: airplane designs, cities, currencies, etc. I.e., Alpha extends what Mathematica has done previously for things like chemical compounds, geometric surfaces, topological configurations, arithmetic series, trigonometric ratios, and equations. In the new cases, as Mathematica did in those abstract math cases, Alpha excels at not just retrieving the stored data but performing various appropriate numeric calculations on the data, and displaying the results in beautiful graphs and easily comprehended tables for the user. The resulting mosaic covers a large portion of the space of queries that the average person might genuinely want to ask, in the course of their day. The interface is not exactly natural language, but can be treated by the user as though it were -- just as users of browsers can treat them as though they parsed sentences even though they don't. A better way to think of it is a DWIMM ("do what I might mean"), so if you type in something like "gdp France / Germany", it calculates and returns a graph of the relative fraction of France's annual GDP to Germany's GDP, over the last 30 years or so. If you just type in "gdp", it looks up your local host and (in my case) displays the GDP of the USA over the last 30 years, plus various pieces of information about what gross domestic product is, from a mathematical formula perspective but not from a semantic one. It does not have an ontology, so what it knows about, say, GDP, or population, or stock price, is no more nor less than the equations that involve that term. See also this video of a lecture by Wolfram about W|A. Is there a China model? Speaking of interesting conferences, check out this one hour documentary on a recent meeting between Chinese and Western intellectuals. I found this while searching for an interview with Azar Gat, whose book War in Human Civilization I am now reading. The two most outspoken Chinese professors, Cui (Tsinghua) and Wang (CUHK), are fairly aggressive in stating their view that the Chinese government is pragmatic and highly competent. However, they didn't fully address the issue of legitimacy in the absence of elections. Reliance on polls and performance indicators presupposes that they are instituted in an honest and effective way. It's odd that all the Chinese academics seem to agree on the main points -- I am sure it would not have been difficult for the organizers to find some dissident perspectives, highlighting problems like corruption, misallocation or resources, social unrest, etc. Still, the overall impression is that few China experts doubt the stability of the current system. At one point Cui notes that (extrapolating current trends) by 2020 the per capita GDP of 300 million urbanites on the eastern seaboard may equal that of Portugal, accounting for a total GDP roughly that of the EU. His numbers seem a bit aggressive, but not totally crazy; see here and here. Is there a China model? -- a video documentation of a China-West Intellectual Summit. ...Can we now speak of a Chinese model, an authoritarian capitalism, which perhaps can even inspire others, in particular now when the crisis that has emanated from the USA drives many people to a critical view of the West? Glasshouse Forum assembled prominent academics from China and the West at Maison Louis Carré outside Paris on 23-24 February 2009 to an intellectual summit on the theme “Is there a China model?” In the video documentation which Glasshouse Forum has produced in cooperation with the production company Edinim, we can follow the occasionally tense debate, moderated by Gideon Rachman of the Financial Times, on the issue of whether there is such a model and whether the rest of the world, including the West, might have something to learn from it. It is significant that no one at the meeting subscribed to Fukuyama’s theory on the end of history. No one saw any signs of China adopting liberal democracy. It was also evident that the Chinese participants considered China to have good prospects to overcome the global economic crisis. This documentation gives fascinating and thought-provoking insights into what may become the political landscape of the future. The participants in the film are: Gideon Rachman, moderator of the summit and Chief foreign affairs columnist for the Financial Times, Timothy Garton Ash, Oxford University, Daniel A. Bell and Zhiyuan Cui of the Tsinghua University in Beijing, Azar Gat, Tel Aviv University, Simon Long, Asia editor for The Economist, Vivienne Shue, Oxford University, Shaoguang Wang, Chinese University of Hong Kong, Feng Zhang, The Foreign Policy Centre in London, Wei-Wei Zhang, Centre for Asian Studies in Geneva and Fudan University in Shanghai, and Yongnian Zheng, National University of Singapore. I have just spent a fascinating couple of days, closeted with some Chinese academics in a house outside Paris, at a seminar organised by Sweden’s “Glasshouse Forum“. Several of the assembled profs were members of China’s “new left” - people like Zhiyuan Cui, an economist from Tsinghua University and Shaoguang Wang of Hong Kong university. I was surprised by how confident they seemed. The consensus seemed to be that China would weather the global economic crisis better than most - and that the Chinese political system is sufficiently robust to withstand higher unemployment and slower growth. One of the participants pointed out that in the late 1990s, 60m Chinese people had been thrown out of work in the aftermath of the Asian economic crisis and the restructuring of China’s state-owned enterprises. But the country’s long-term trajectory remained ever upwards. Another participant joked that China had discovered that whatever country it models itself on is doomed. In the 1950s China had modelled itself on the Soviet Union; in the 1980s there was a fashion for imitiating Japan; and more recently, there has been a fascination with American capitalism. It was a nice joke that I think contained a broader insight. Western analysts tend to measure China’s economic and political progress by asking - are they becoming more or less like us? More democratic, more free-market; or more authoritarian and state-directed? The Chinese participants seemed to be arguing that their country was finding its own unique way to modernity. Zhiyuan Cui was keen on the idea of a “socialist market economy”, which allowed space for both private enterprise and for a large and profitable state sector. The new left generally believe that socialism remains a genuine ideal in China - and not just a rhetorical hangover from a bygone age. Others, in particular, Daniel Bell - a Canadian who teaches philosophy at Tsinghua - reckoned that the Confucian tradition was increasingly important in modern China. And Zhang Wei-Wei, who used to be Deng Xiaoping’s translator and is now a professor at Fudan University, argued that the idea that legitmacy is conferred on a government by elections is a western-obsession. The Chinese believe in “performance legitimacy”. If the government governs well, it is percieved as legitimate. I am sufficiently western to find this not entirely convincing. And I am not sure what kind of results the Chinese government will be able to produce, in the face of a world-wide slump. Asia’s rise has brought about profound changes to the international system and the current world crisis presents the continent with both opportunities and challenges. The initiatives and responses by Asian countries, China and India in particular, have the potential to define the world’s path of development now and in the future. Chen Jian holds the Philippe Roman Chair in History and International Affairs at LSE IDEAS for 2008-09 and is the Michael J Zak Chair of the History of US China Relations at Cornell University. Danny Quah is head of department and professor of economics at LSE. Athar Hussain is director of the Asia Research Centre, LSE. The meeting went full speed from 9 AM until late at night for four days. The attendees were a mix of theoretical physicists (with particle physics and complexity theory, especially the Santa Fe Institute, well represented), practitioners from Wall St. (often from a math or physics background), academic economists (Barkley Rosser, Richard Freeman, etc.) and evolutionary biologists. See here for video recordings of talks. There were many good talks but I especially recommend Doyne Farmer's for the physicist's complex systems view of economics. Too much ground was covered for a short summary, but one area of interest for almost all attendees was the possibility of going beyond the neoclassical paradigm via simulations of interacting agents. Examples of such simulations were discussed in several of the talks, including by Santa Fe "ant farmers" Bruce Sawhill and Jim Herriot, who used agents to model air traffic for the ambitious DayJet startup (see here and here). The technology is certainly there to do some massive, quasi-realistic simulations of an actual economy (as opposed to an isolated financial market or sub-economy). The main problem, which wasn't given as much attention as I might have liked, is that the results are limited by the quality of the individual agents, who must have at least rudimentary learning capabilities to be realistic. Hence one is led full circle back to problems related to AI, machine learning and even psychology or cognitive science. When I wasn't at the conference I managed to have several interesting physics discussions. Below are links to some recent work by John Conway and Simon Kochen that came up in two separate conversations I had at Perimeter -- one with Rob Spekkens (he and I were discussing related issues, although he didn't mention these papers specifically) and with Nima Arkani-Hamed, who was visiting from IAS. On the basis of three physical axioms, we prove that if the choice of a particular type of spin 1 experiment is not a function of the information accessible to the experimenters, then its outcome is equally not a function of the information accessible to the particles. We show that this result is robust, and deduce that neither hidden variable theories nor mechanisms of the GRW type for wave function collapse can be made relativistic. We also establish the consistency of our axioms and discuss the philosophical implications. See also the Strong Free Will theorem. I feel the name of the theorem is a bit misleading, but inevitably so as it is quite difficult to define free will. The main feature of the papers is the great clarity of thought and presentation. In content, they are not so different from the older GHZ result which was formulated in terms of what the authors called local realism. To be honest I don't quite agree with Conway and Kochen's interpretation of their own results -- it's obvious that the results are easily consistent with many worlds quantum mechanics, which does not (at least from my spacetime perspective) allow for free will. Here are 6 lectures on the theorem and related topics, given by Conway recently at Princeton. See also 'tHooft's response to their result. 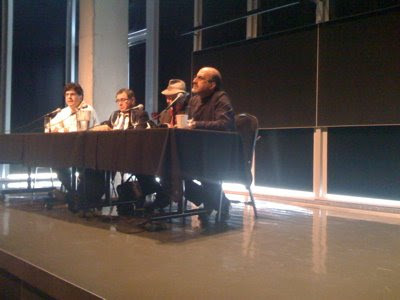 The first photo is the morning panel discussion. From left to right, Eric Weinstein, Nouriel Roubini, Richard Freeman and Nassim Taleb. 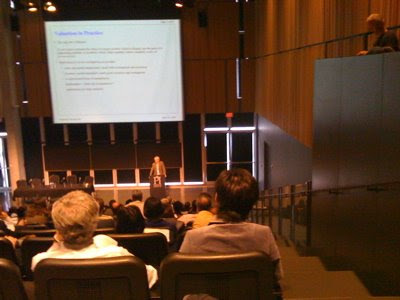 The second photo is of Emanuel Derman's talk. In the upper right hand corner you can see Doyne Farmer of Santa Fe. The talks today were for a general audience -- my favorite was Andy Lo's. I hope the next two days of the meeting will be a bit more technical.